Just back from the Athenaeum in London where, at the kind invitation of my friend John Wilson, I gave a talk about – wait for it – the Oxford English Dictionary. None of the OED’s original editors were members of the Club, though it turns out that my predecessor Robert Burchfield was. 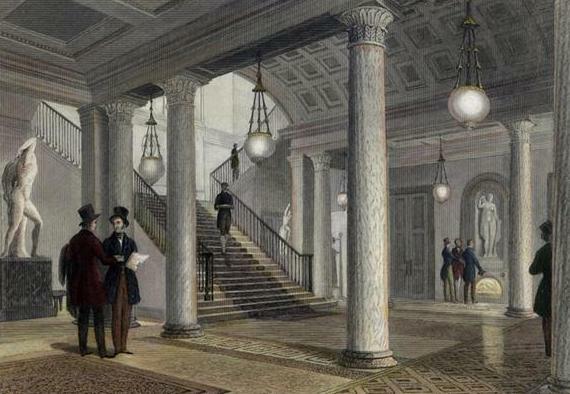 Like the OED, the Athenaeum is often thought of as a refuge for the literary: Dickens and Thackeray were members, for example, and it is said that their famous handshake at the doors of the Club in 1863 may have indicated their reconciliation after Thackeray had objected so strongly to Dickens’s public separation from his wife. But that had all been brushed under the carpet this week, and they were the friendliest audience I have encountered for a while. I often find this a helpful thing to say about audiences. Both the OED and the Athenaeum are in fact full of scientific, philosophical, and even military content. My prime example of the importance of non-literary sources for the English language was that the British hero and Athenaeum founder, the gallant Duke of Wellington, was the first person (according to the OED) to introduce the British public to the word ganja.